Supporter and soutenir both translate into to support in English, but are not always interchangeable in French. Le père soutient la bicyclette et il soutient son fils moralement. Il ne supporte pas l’idée qu’il puisse tomber. The father holds the bike and supports his son. He cannot stand the idea that he may fall. With things, both verbs have the idea to help a structure, to hold it in some sort. Il a mis un morceau de bois sous la branche pleine de pommes pour la soutenir. He put a piece of wood under the branch full of apples to support it. Supporter is a bit stronger than soutenir since the root verb is porter= to carry, versus tenir = to hold… But they are almost similar in that meaning, and more or less interchangeable. Cette poutre supporte tout le poids de la baignoire. This beam supports all the weight of the bathtub. Soutenir has a positive meaning: it’s to support someone as in to encourage someone, or help them mentally, physically and often financially. His Dad supports him financially. Un soutien is the noun derived from soutenir. His presence is a huge moral help to me. That’s where the word “un soutien-gorge”, a bras comes from. The gorge in old French was not just the throat, but the whole chest area. So it literally meant “hold the chest”. Watch out with the word “un souteneur” which is a used for a pimp in French! 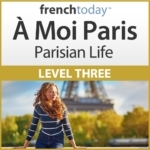 4 – How do You Say Fan and Supporter in French? 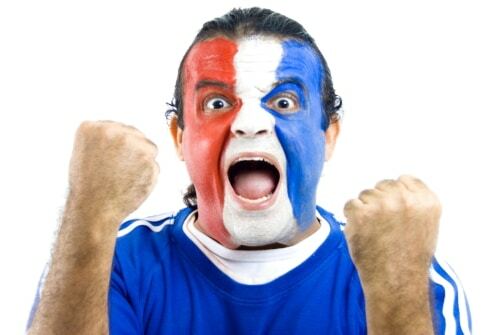 Unfortunately, it’s a common anglicism to nowadays use “supporter” + team, because of the word “un supporter de foot” – a soccer fan… So you’ll hear French people say “je supporte l’équipe des Bleus”… But it’s a mistake. The correct French verb to use here would be “soutenir”, or “encourager”: “je soutiens / j’encourage l’équipe des Bleus”.